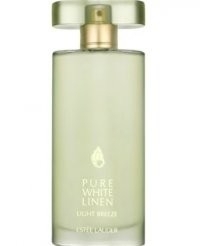 Estée Lauder Pure White Linen Light Breeze Eau de Parfum Spray is vibrant and fresh. Wet Citrus notes of luscious Bergamot, Orange Zest and White Grapefruit combine with Darjeeling Tea, colourful florals and sheer woods. Let the fragrance linger in your senses for hours. Created in 2008 as a limited edition by Laurent Le Guernec who also created 9 IX Rocawear for Rocawear in the same year. Very aqua and very fresh. The tea scent isn't particularly appealing to me but it does make a statement in this slightly complex mix. A very interesting alternative and great in warmer weather.